Wow!!! Gosh!!! We have been so busy here at the Carriage House. All things are new and good. As I said, been so busy but a busy good. We have met so many great people in the short time we have been here. So blessed to have been given this opportunity to do what I love and what I have always loved to do. They say people, time and experiences tend to come and go. How so true that is .The great thing about this place is that I have been blessed with people (guests/friends) that come and go and come back again and again. Yippee for me. I want to believe Yippee for them too.. The Carriage house is moving so fast right now. We have had a Halloween Celebration, 3-4 Thanksgiving celebrations, Christmas with the Tour of Homes, Mardi Gras and Valentines. All of this within 4 months of buying the Carriage House, Jefferson. I have enjoyed every moment, every person, every four-legged friend…..every ounce of sleep I have to force myself to get. I must be crazy you say. Yes, I am. Crazy in love with my occupation and the chance to live my dream. Enough of me. Thank you all that make this a reality. We are making changes. Things are moving slower than we thought, who would have known we would have been accepted so well by our guests. They say Rome wasn’t built in a day and creation took 7 days. PATIENCE, I tell myself. We are working so hard to bring the ultimate weekday/weekend experience to our guests. New and repeating guests. We have just acquired our food permit. We can do so much with this still keeping with the intimacy of the small bed and breakfast aspect. We are working on our amenities packages and pricing and a build your own package that will suit everyone. Please have patience with us until we get the whole website thing together. With our newly acquired food permit, we plan to start serving lunches and early evening fares to our guests to be served in the dining areas which include the wrap around porch and other potential areas. Room service menus will be posted in each room for selected hours also. On Friday and Saturday nights, we want to offer all of our guests an option to order a 4 course dinner when they make their reservation. So keep watching us to see when all of this will be available. If you build it, they will come. So from the Carriage House, I say good night. Next month all around the country, Americans will be celebration Mardi Gras. Along with New Orleans, Louisiana and Mobile, Alabama, Jefferson, Texas also has a cultural link to the Mardi Gras Celebration. From 1845 to the late 1870s, Jefferson was a steamboat trading partner with the city of New Orleans. New Orleans’ steamboats traveled North on the Mississippi and veered off onto the Red River traveled across to Caddo Lake and then up Big Cypress Bayou to the Port of Jefferson. The New Orleans influence is still recognizable in the architecture and heritage of Jefferson. Jefferson’s first Mardi Gras celebration was held in 1871. By 1876, Mardi Gras In Jefferson, Texas had grown into a city wide celebration that still carries on the tradition of the Mardi Gras Upriver Celebration where revelers dress in purple, green and gold, dance in the parades, eat cultural foods, and catch beads off of the many floats and balconies that line the streets. We here in Jefferson, Texas hope to see you at the celebration. 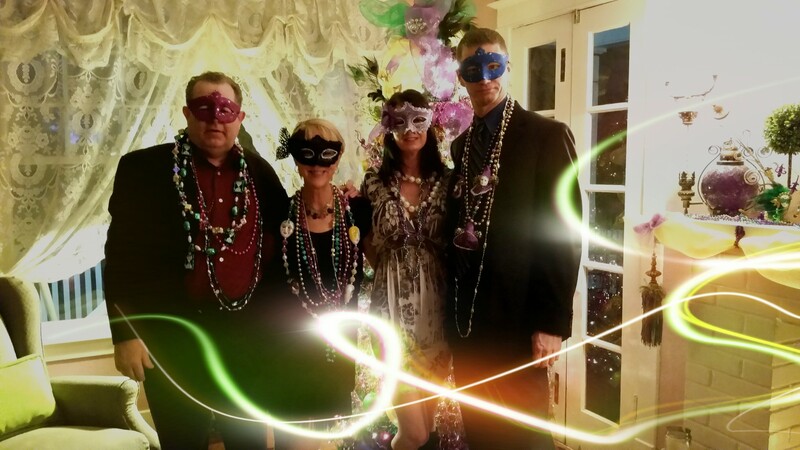 Put on your green, gold and purple and come and join in Jefferson’s Mardi Gras Upriver Celebration. The celebration will consist of three parades, carnival, food vendors, arts and crafts, live music along with fun, frivolity and zany events during this three day celebration. Friday evening begins with a Doo Dah Parade. Saturday features a Grand Parade with colorful floats, marching bands and more. Sunday allows the kiddos to get in on the action with a Children’s parade. The bed and breakfasts are all decorated with the spirit of the celebration. The local restaurants will have specials and music playing everywhere. Plenty for all to do. Until then, Mardi Gras “Fat Tuesday”lie in the Christian calendar as the “last hurrah” before Lent begins on Ash Wednesday. Some see Mardi Gras as a late-winter celebration welcoming the coming of Spring. February 6th, 7th & 8th join in the celebration. One by One we are making improvements at the Carriage House in Historic Jefferson Texas, many of our guests had spotty internet reception from our WiFi. This is a short post to let everyone know that we have installed WiFi boosters so all the rooms will have a solid connection to the internet. Now you can enjoy all the history Jefferson has to offer and still have connection to the web for business or pleasure while staying with us at The Carriage house. My first blogging post. Hmm-mm, what to say? If and when you ever meet me, I promise you this problem of what to say will never occur. I’m a chitty-chatty one. This world of running a bed and breakfast is a new experience for me even though I have been serving people and entertaining guests for over 30 years, I do feel quite comfortable here at the Carriage House. I have so many plans for the future of this amazing house. I hope you all stay tuned to see what I come up with. I have been collecting ideas for about five years now. You should see the binders and binders of notes I have. Now just to compile them into one big ole plan and decide what to actually put into place. There are so many great things on the way. Stay tuned. As I learn how to work this thing called a computer and a camera and figure out how to download stuff, I will entertain you with all of my antics, new recipes, gardening tips, pet friendly treats and the wonderful ways of people that will now influence my life and yours. So many people I have met in the last 3 months have filled me with joy and made me realize that this dream I have had for so long is actually a reality and it is everything I had ever imagined it would be. My guests have introduced me to their families, sent me their favorite recipes, ran around town with me, sat in my kitchen, roasted marshmallows and toasted wine with me. One guest even let me drive their car ( I have a very small hard top convertible that is not very satisfactory to my new grocery shopping needs). What a glorious life in front of me. I hope in time everyone that visits the Carriage House comes to love this place as much as I already do.My door is always opened. I look forward to meeting and chatting with all. Join us at the Carriage House In Jefferson. The First Annual Antiques Appraisal Fair will be held on Saturday October 25th from 10:00 am to 5:00 p.m. After the Fair, come back to the Carriage House and enjoy your favorite beverage wrapped in one of our comfy blankets next to the warm fire located in the courtyard. Tickets are now on sale for the ultimate Halloween experience, in Jefferson Texas. Be sure to goblin’ up tickets to the 13th Annual Runaway Fright Train and Halloween Festival each Friday and Saturday, October 4-31, 2014. Steam hissing, whistle blowing and pistons chugging, the Historic Jefferson Railway’s live steam train returns to operation in October 2014 for the Runaway Fright Train and Halloween Festival. The Runaway Fright Train will feature “Monsters from the Deep”. As you ride through the dark woods, you’ll see the monsters emerging from the swamplands of East Texas as they reach out for you. Keep a wary eye toward the cypress-filled woods and swamps. You never know what lurks in the shadows. The train rolls right by the Alligator Pit, filled with alligators ranging from six feet to over twelve feet long. What are some of the highlights of this theater on wheels? Chain saws, toxic wasteland, land of rats, spiders and snakes, skeletons and ghouls. Something sinister is hiding there. You’ll be spooked by more than Halloween ghosts! The scenes and haunters along the track will keep you at the edge of your seat and give you a laugh now and then, too. This Halloween Theater on wheels is professionally directed by East Texas Performing Arts. This is a family-friendly event for ages 2 to 92for a howling good time. The Fun Brothers bring their alligator bounce house to the Halloween Festival each evening of the event. Admission is free with the purchase of a Halloween train ride. Other free activities will include mini-maze, mini-haunted house, children’s crafts and games. Glow sticks and other Halloween products and concessions are available for sale in the Haunted Historic Depot. Give your little monsters some wholesome Halloween fun this season. On Halloween evening, come participate in Best Costume Contest for CASH PRIZES. Prizes awarded after each train ride. The event will take place at Historic Jefferson Railway, 400 E. Austin, Jefferson, Texas. 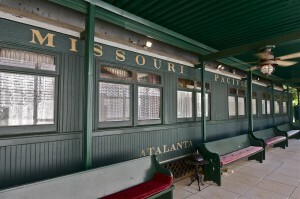 The easiest way to order tickets is to visit the website, www.JeffersonRailway.com. You can also buy tickets at the Historic Jefferson Railway depot during event hours. Train seating is limited so get your tickets early! Come out for a rip-roaring good time. 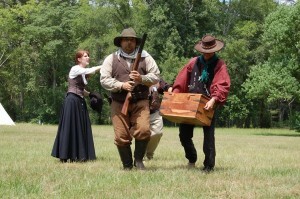 Historic Jefferson Railway salutes “National Day of the Cowboy”, July 25 and 26, 2014 as they recognize pioneering men and women who helped establish America’s frontiers. Enjoy the rough and ready cowboys of the Lonely West Traveling Gun Show complete with cannons, gunfights and a train robbery. Limited seating, so get your tickets now at www.JeffersonRailway.Com or call 866-398-2038. Start Friday at 7:00 p.m. with free cowboy ghost stories at the air-conditioned depot, and then jump on the Cowboy Ghost Train at 8:00, an antique narrow-gauge train that traverses the Piney Woods along the Big Cypress Bayou in the deep dark woods. The open-canopied observation cars offer a perfect view from every seat. Be careful out there. Everything you see might not be part of the show – if you feel a cold chill, that’s a ghost, for sure. On Saturday, the Historic Jefferson Railway and the Lonely West Traveling Gun Show do repeat performances of the Cowboy Train at 12:30, 2:30, 4:30 and 8:00 at 400 E. Austin, with free cowboy ghost stories at the air-conditioned depot at 7:00 p.m. Come out for a ride on a restored gas-powered Plymouth Locomotive built in 1964. The excursion train circles the Piney Woods on a five-mile track along the Big Cypress Bayou where you see the beautiful views of the wetlands and wildlife as well as remains of many sites from the 1880’s still visible along the track. Don’t let those cowboys drag you off the train! 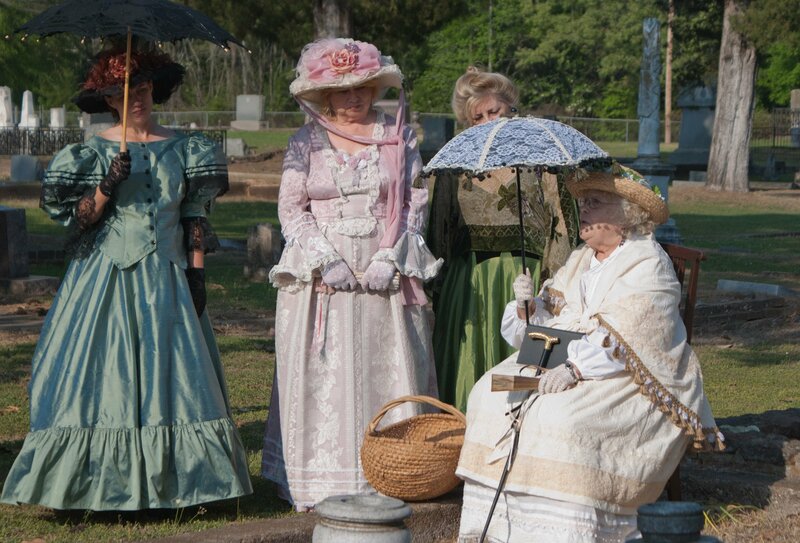 Jefferson, Texas is nestled deep in the Piney Woods of East Texas and seems frozen in time. It is a charming town and an elegant reminder of a bygone era. There are over a hundred buildings in the city with historical markers. Many historic homes offer bed and breakfast accommodations. Dozens of other historic buildings house museums, craft and antique shops and restaurants. So come Dine, Shop & Stay, in Jefferson, Texas. Country music artists from nine nations will come to Jefferson, Texas this summer to perform in concert as well as compete for the title of Texas Sounds International Country Music Performer of the Year. Produced by East Texas Performing Arts, Inc. (ETPA), top country music bands and solo artists from Australia, Canada, France, Spain, South Africa, Sweden, Switzerland, the U.K., and the U.S. will perform in concerts daily. In August 2012 ETPA was part of a two weekend theatre, music and art event. Last year ETPA produced a nine day theatre and music festival that included the musical Bye Bye Birdie, two one-act dramas, and music from Richard Bowden and John Early, Lacie Carpenter, Shane Mathews, and Sarah Griffin. For 2014, ETPA is expanding to four weekends with top international country musicians. Event producer and ETPA board member Preston Taylor explained, “I started searching the web for unusual acts and ran across a band called East Texas. They play rockabilly and western swing and advertise as being from the Deep South… of Australia. Their home, Adelaide, is at the very southern edge of the Australian continent, truly the world’s Deep South. We wrote them a tongue-in-cheek email with several reasons why a country band called East Texas should play in Jefferson. I also cited several reasons why it might not be a slam-dunk idea, starting with, we can’t pay you. Dynamic rockabilly and western swing with a highly polished 50’s flavor. Spain’s most popular country artist, with a hard acoustic rhythm all his own. The UK’s fastest rising star, Sarah has shared the stage with Chip Taylor (Angel in the Morning), Al Perkins (The Band, The Eagles, Bob Dylan), Gail Davies (the first female record producer in country music), and many more. Montreux Festival. Britta has toured in Ireland, France, Sweden, and Italy. South Africa’s top female country artist, having released albums in Afrikaans and English, Chrissie is coming to Jefferson for her first U.S. performance. Pure, sweet acoustic country sounds from Sweden. Every note is a delight. Great voices, original lyrics and wonderful instrumentation make this a group not to be missed. Featured trending artist on Reverbnation from Temple, Texas. Intensity and an exorbitant personality from Nashville. Negotiation continues with 40 more acts from 18 nations. For more information please call ETPA at 925-497-3915. All concerts are at the Jefferson Visitor Center, 305 E. Austin St. Tickets are $15 for an individual concert. Special discount packages for multiple concerts are available. For lineup updates and performance times, please visit the ETPA website. ALL ABOARD for Jefferson Train Days, May 17th and 18th. Tickets are now available online at www.JeffersonTrainDays.com or call 866-398-2038. One boarding pass admits you to four destinations. You will want to get your tickets early as seating is limited on the train. Ride the Historic Jefferson Railway and experience The Lonely West Traveling Gun Show, including cowboys, guns and a train robbery. Visit the R.D. Moses model train layout at the Jefferson Historical Society and Museum. 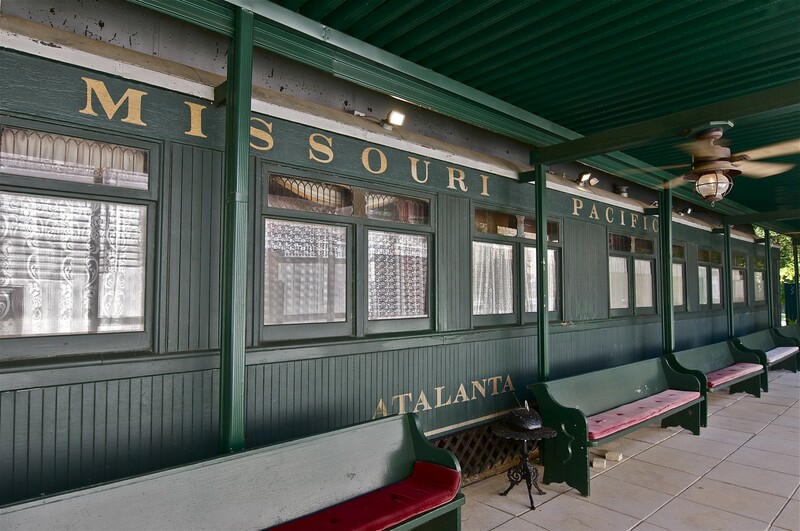 Tour the resplendent business car, Atalanta, that belonged to the rail baron, Jay Gould. See the model train show, layouts and vendors at the Jefferson Transportation Center. Hear the sounds of yesterday at the Whistle Toot where more than thirty whistles will sound off. Patrons can blow the whistles and whistle enthusiasts can bring their own. There will be educational clinics for model railroaders, too. Come out for the day or for the weekend. There is a lot for the family to do in Jefferson Texas.